Shocking statistics have been revealed confirming that 1 in 13 women in Yorkshire and the Humber have experienced domestic abuse in the last year. Figures from the Office for National Statistics reveal that 7.7% of all women aged 16 to 59 in this region were victims of domestic abuse at least once in the last year. Alarmingly, this means that an estimated 119,500 women and girls in Yorkshire and the Humber suffered abuse in 2017. Sadly, domestic abuse is extremely common in many relationships as these statistics show. 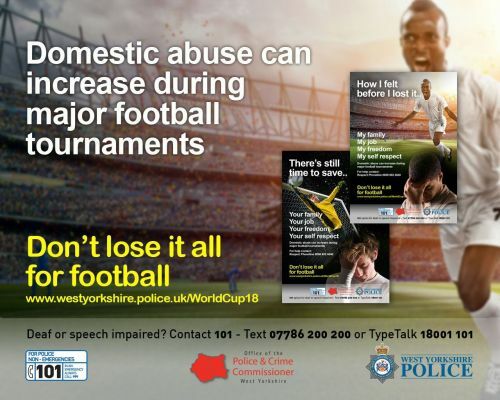 The West Yorkshire Police have also recently made reference to domestic abuse increasing during the World Cup which is due to commence on Thursday 14th June 2018. The first game will see Russia play Saudi Arabia. Russia are hosting the World Cup. It is thought that the reason domestic abuse increases during this time is due to perpetrators consuming more alcohol than usual. The result of a game can also effect that persons mood which can lead to aggression and violence particularly, coupled with alcohol consumption. Domestic abuse is never okay. Irrespective of the alleged reason that it takes place. Nobody should have to tolerate or be a victim of domestic abuse. It can be very difficult for someone to leave a domestic abuse relationship but at Ramsdens we are here to help from a legal perspective. We often work with clients that have fled domestic abuse and in some cases they have children as a result of the relationship. We can provide immediate support to the victim of domestic abuse and if necessary, we can apply to the Court for a Non-Molestation Order (often referred to as an injunction) for immediate protection. We can then provide help and advice in relation to protecting the children of the family and considering the long term care arrangements for the children. Our specialist Solicitors deal with matters concerning domestic abuse and children in a sensitive and appropriate way. We understand that taking legal advice can be a huge step and we are here to help you every step of the way. Ramsdens also have many working relationships with local charities and services that can provide you with a great deal of help and support for you and your children in relation to domestic abuse and the effects of this. Call our Family Team Helpline on 08000 147720 to book a free consultation appointment at any of our offices. We will always accommodate urgent appointments on the same day where necessary. Are the Courts putting an end to the “meal ticket for life”?